In 2012, 244 gang killings were recorded in a six month period in Chicago. During the same time period, 124 soldiers were killed in Afghanistan. These facts inspired Chicago's noted activist pastor, Father Michel Pfleger of St. Sabina, to act. With a purpose to nurture and spiritually develop, Father Pfleger and The Faith Community of St. Sabina have become a leaders and a model for faith-based communities using sport to "penetrate the world in order to present God's way of living as a divine option" by not being "confined by the walls of the sanctuary." Thinking out of the proverbial box, Father Pfleger and a collective of renowned Chicago natives and leaders created the Peace League Basketball Tournament. 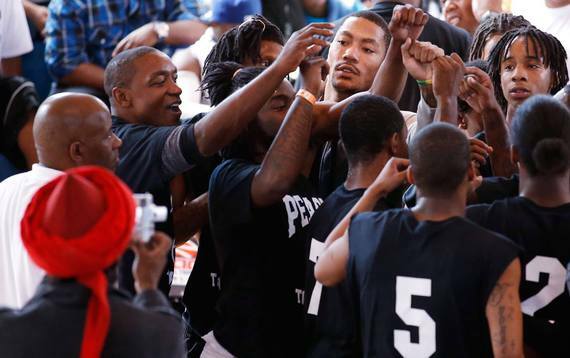 "The tournament came out of a whole summer of relationship, of going out and talking to brothers in the streets. Trying to bring down the violence, trying to do that initial piece of just stopping the shooting." During its year of inception, the Peace League Basketball Tournament was held the day after the final summer, weekly peace march, "Friday Night March," conducted by St. Sabina. 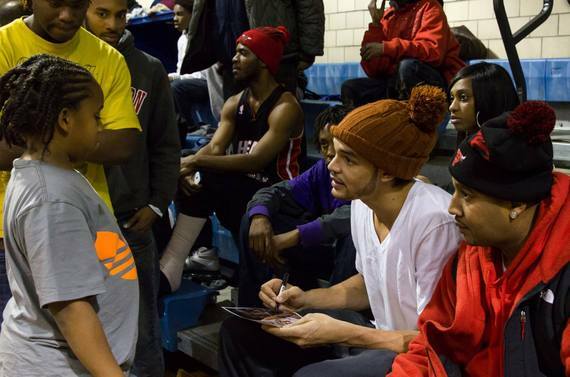 After getting the support and agreement of four gangs, their four leaders, Cobe Williams, Asa Powell, NBA player Joakim Noah and NBA legend Isiah Thomas set the date. Four rival teams competed against one another while being watched by NBA players Derrick Rose, Quentin Richardson, Zach Randolph, Bobby Simmons; NFLer J'Marcus Webb; and then high school stars Jabari Parker and Jahlil Okafor. 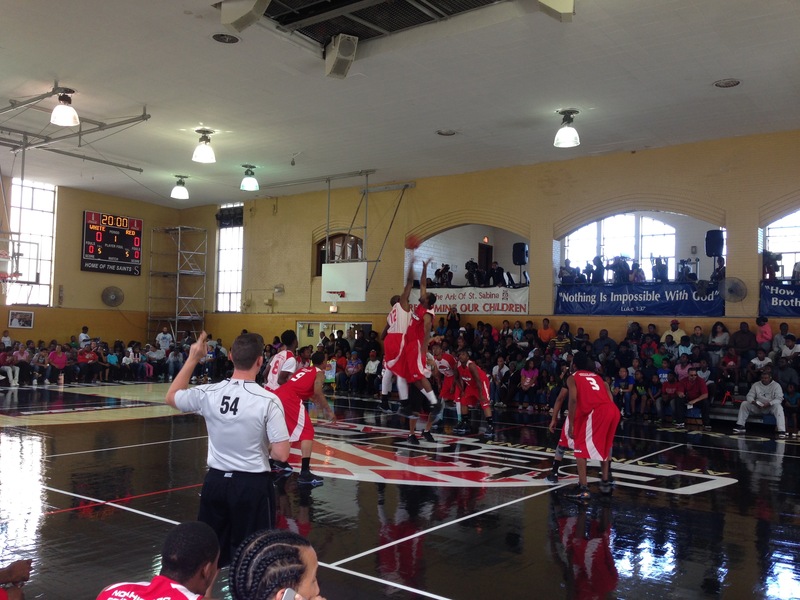 Veteran NBA referee Danny Crawford, Mark Davis and Jim Capers officiated the action. "Two weeks before the event two young people were gunned down from two separate gangs. The four leaders helping to put the tournament together said let's try it," said Pfleger. Concerned for the safety of the Peace League Basketball Tournament participants, the collective organized buses to have them picked up "so they wouldn't have to cross enemy gang territory." Father Pfleger was ordained a priest of the Archdiocese of Chicago in 1975. In 1981, he became the youngest full pastor in the diocese when he was appointed Pastor of St. Sabina. Over the thirty-five years of leading the Catholic congregation, now with Associate Pastor Father Thulani Magwaza of South Africa, Pfleger has become recognized for his superior service in the spirit of Dr. Martin Luther King. "I became obsessed with Dr. King. The more I studied about him and realized that he really believed we could change the world and he really believed faith was the foundation to which you do it. The laws can change the way you act. But, you know, only faith changes the way you feel, think on the inside." No stranger to violence and personal grief, Pfleger lost a foster child, Jarvis Franklin, to gang crossfire in 1998. As Pfleger's third adoption in 1997, the violence epidemic hit his home. Not lacking faith, Father Pfleger would continue to be inspired, and inspiring, in the years to come after suffering a such a lose. "Just one person can spark the mind and change the viewpoints of a lot of biased folks out here who really don't think the system itself is unequal," said Milwaukee Bucks forward and Chicago native, Jabari Parker. During "An Undefeated Conversation: Athletes, Responsibility, and Violence" hosted by The Undefeated on ESPN, Parker stated he believes all it takes is one person to create change. "The church is a change agent that builds agents of change," Pfleger said. Since starting the Peace League Basketball Tournament, the PeaceMakers Basketball League, was formed. Offering mentoring, GED classes, internships and dress suits, the basketball league programming has helped hundreds of young men. The Peace League Basketball Tournament has morphed into more than a sporting event. The spiritual foundation has transformed lives. "Chicago was a very powerful experience," said the Miami Heat's Wayne Ellington. "We did a Peace Walk and had the Peace Games the next day," Ellington explained about attending last year's festivities. Having lost his father to gun violence, Ellington said " it's just good to see the community come out and how badly they want to see change. So many guys came out and want to be involved." Ellington hosted the inaugural Philadelphia Peace Games last month, inspired by his time in Chicago. "This is an historical event where the games are coming together and they're going to play a game involving peace," Isiah Thomas said speaking on the upcoming event. "Its just about letting them know they're the solution to the problem. And, even though they have been identified as the problem, they really are the solution and they have power and they have the ability right now to change the world." Father Pfleger agrees with Thomas and references his teachings from Dr. Martin Luther King. "He taught me the blueprint that church is supposed to be an agent of change that builds agents of change. That's where I got my passion from," he stated. "So let's go change the world!" The 5th Annual Peace League Basketball Tournament will take place on Saturday, September 17th, from 12:00 PM to 6:00 PM, at the ARK of Saint Sabina Gym located at 7800 South Racine Avenue in Chicago, Illinois.